Aloha. 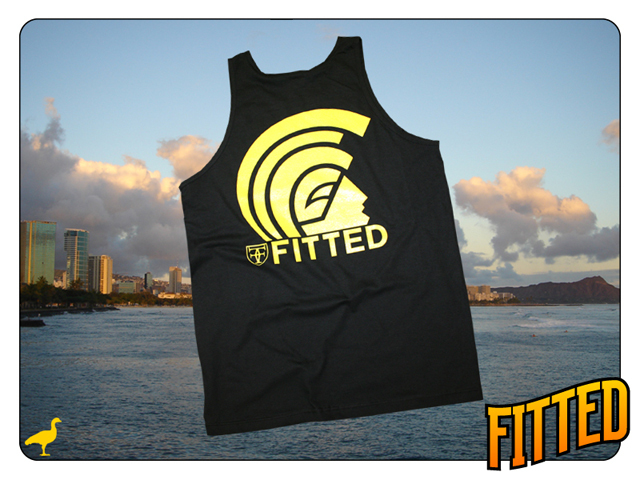 This Saturday’s release features yet another classic pairing: our Islanders tee and an orange Aloha snapback. 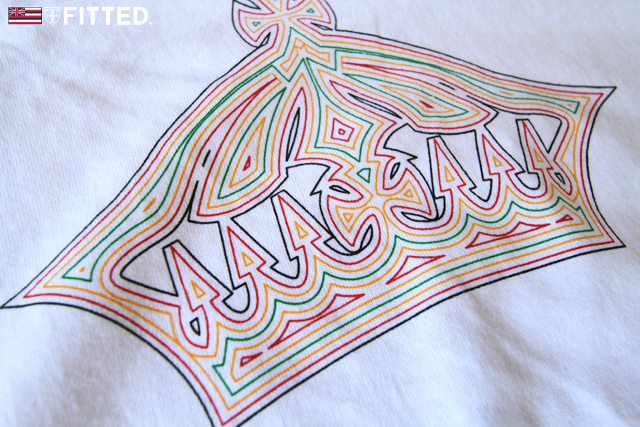 The Islanders tee is done in the style of a raglan sleeve jersey; two tones. 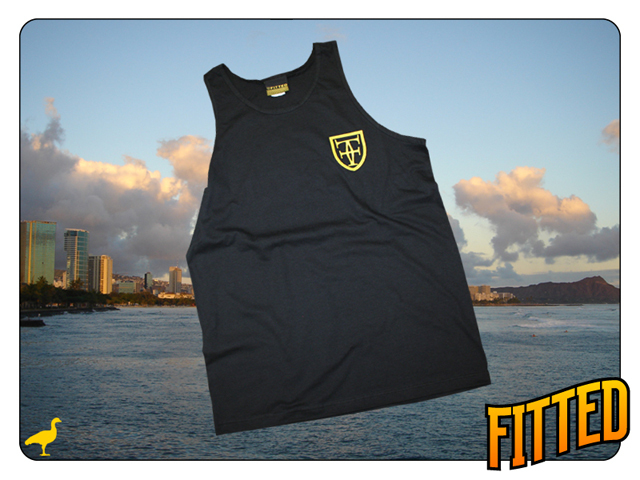 The sleeves are black and the rest of the tee, white with an orange and black Islanders logo on the front. The backside, also in orange and black, features FITTED and the number 50. Releasing alongside is an all black Aloha snapback with an orange Aloha stitching with a white stroke, topped off with an orange button and white snap. 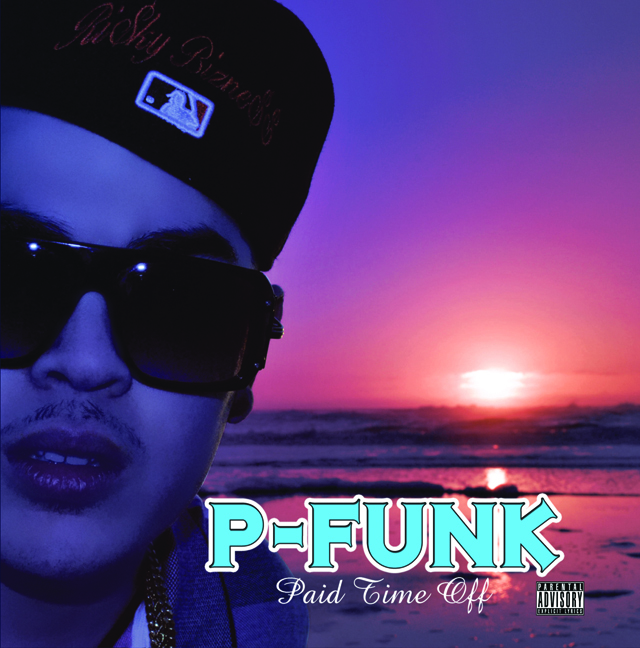 P-Funk, “my patna dem,” just released his debut album, “Paid Time Off.” If you like that feel good, summer time music, this album is a must have! Here is one of his tracks titled “Mini Vacay,” where he gives a shout out to yours truly and the shop! We have some copies of the album, so come through and support! Aloha! 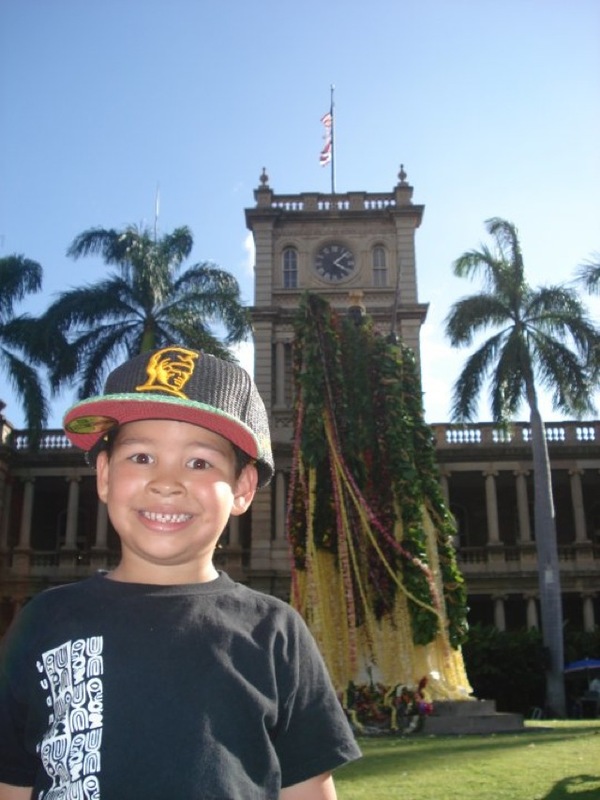 This week’s winner of our Fitted Facebook Photo Challenge goes to Tanner-Michelle Henderson and her son, Nahikulama’okealaula. Congratulations Tanner, and please head down to the shop at your earliest convenience to claim your prize! Mahalo to everyone for participating, and due to a few requests, we will be upping the prize for next week, so break out your cameras and get flicking! As I was doing my daily blog checks today, I came across a photo of Hype 5-0 rehearsing for this weeks “Magic” challenge on ABDC, and I was hyped see that they are using our “Kill ’Em with Aloha” Pride hat. They are in the final four of the contest and I want to wish them luck! 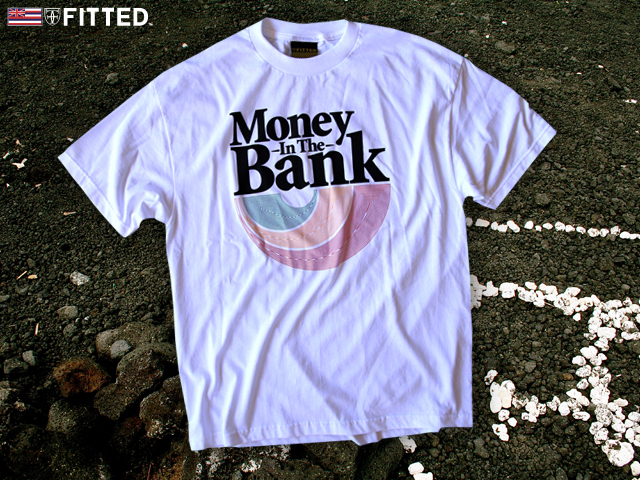 Support Local skateboarding, surfing, business, crews, etc. So go out and vote for HYPE 5-0! This Saturday’s release is a bit nostalgic, as we’ve revisited two classics from our vaults. First up is our Escape To Paradise which was in one of our first ever releases back in October 2005. The phrase “Escape To Paradise” is from the infamous film Carlito’s Way with Al Pacino, alluding to a dream-like-state scene where Carlito sees a poster that reads the phrase, a scene which shows the poster in vibrant colors while the rest of it is shot in black and white. Instead of a t-shirt, we’re presenting it on an all black foam trucker hat. 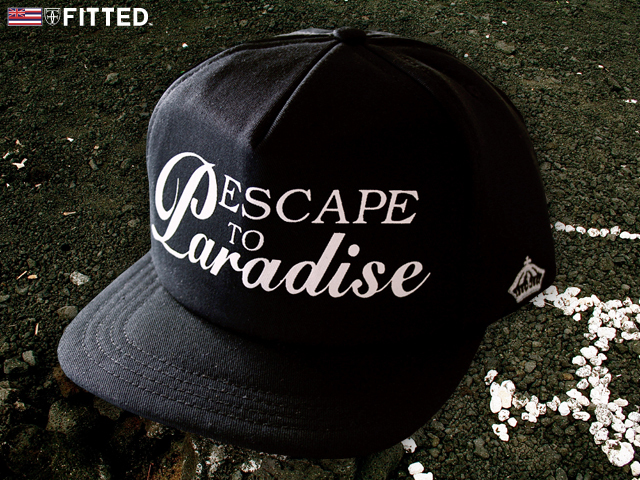 The front reads Escape To Paradise in white (printed), the right side features the crown and the backside, our crown with a white snap. These are going to be really cheap too, so don’t pass on this! Perfect for the beach / bbq / etc. 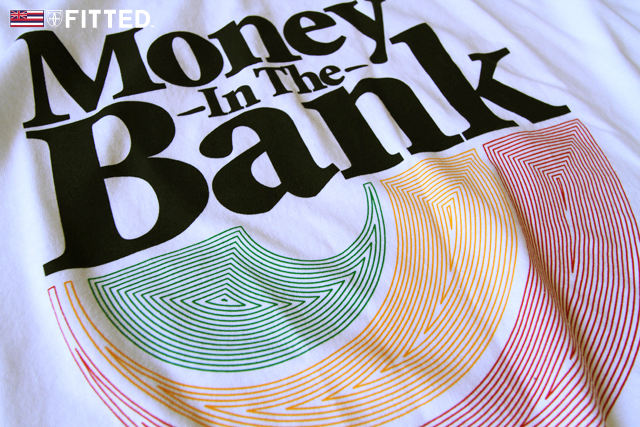 The second re-visitation of a classic is our Money In The Bank tee; this time printed on white with the legendary graphic printed on the front (black, green, gold and red) with a crown hit on the back. Limited supplies per the normal. Also, please don’t forget, this Saturday we’ll be announcing the winner for our raffle contest. You still have a couple days to up your chances of winning!